Gather around closely folks, because I’m going to tell you a little secret about this molecule. Something lots of people don’t know about. Something you’ll never believe. … you can’t actually buy cyclopentadiene! You heard that right.It’s not commercially available. Nobody on Earth sells the stuff. Call up Aldrich and ask for some. They’ll tell you that they don’t have any. And by “goes away” I don’t mean that it evaporates… I mean that it changes into a different molecule altogether. The new molecule has a molecular formula of C10H12 and has a completely different structure from cyclopentadiene. But check this out, folks. I’m about to tell you another little secret. A mind-blowing secret THEY don’t want you to know about. Now only $19.95! FREE! limited time offer! If you heat dicyclopentadiene to 180°C, and then distill it, you get your cyclopentadiene back! So what the heck is this “dicyclopentadiene” stuff, anyway? How does it form? And what happens when you heat it? How do you get cyclopentadiene back? What about this “Diels-Alder reaction with itself” ? That means that one molecule of cyclopentadiene acts as a diene, and another molecule of cyclopentadiene acts as a dienophile. Here it is below, drawn in a way so that it looks just like all the previous Diels-Alder reactions we’ve shown in this series of posts. As we’ve seen, the Diels-Alder can form both endo and exo diastereomers [see: Exo and Endo Products In The Diels-Alder – How To Tell them Apart ]. (only the endo is shown here). Nothing new to see here, so far. Here’s the cool thing (and – shhhh! – the secret behind that “One Weird Trick” ). At high enough temperatures, the Diels-Alder reaction is reversible. That’s right. 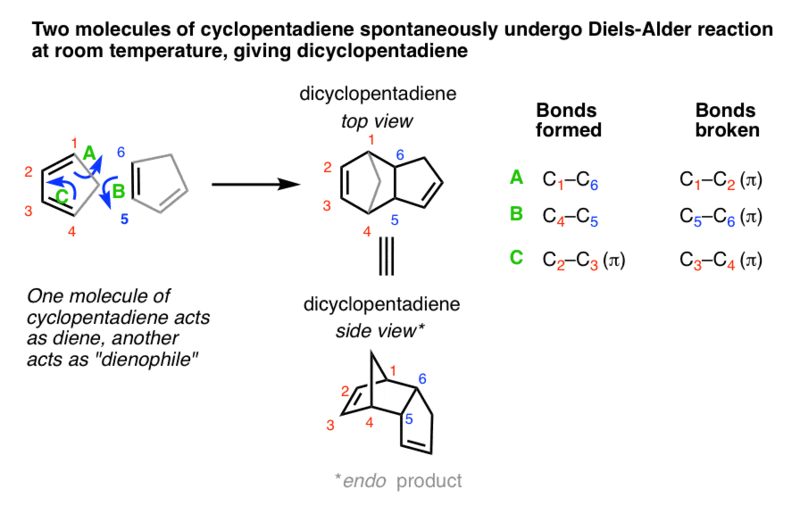 If you heat the product of a Diels-Alder reaction to a high enough temperature, the reaction can progress in reverse, regenerating the starting diene and dienophile (which both happen to be cyclopentadiene in this case). two single bonds + one pi bond are broken. Since the Diels-Alder is reversible at high temperature, this means that we should actually draw it as an equilibrium! Here we show ΔE (red) as the activation energy for the Diels Alder reaction in the forward direction, and a second ΔE (in blue) depicting the activation energy for the reverse reaction (with the endo depicted). At low temperatures, only the forward reaction is energetically accessible, but at higher temperatures, the reverse reaction can occur. You may very well ask why you need to care about this. Well, with a little more detail added, it will help us to solve at least one important lingering mystery. Helpfully, this also ties back to a concept we’ve already learned! In fact, it turns out to be another example of a concept covered earlier in this section on dienes, called Thermodynamic and Kinetic Control [See: Thermodynamic and Kinetic Control]. We saw examples of 1,2- versus 1,4 addition of HBr to dienes and wondered why it was that low temperatures favored the formation of the less stable product, whereas higher temperatures favored formation of the more stable product. We saw that at low temperatures (where the reaction is irreversible) products with the lowest-energy transition state were obtained [kinetic control] whereas in situations where the reaction was reversible (higher temperatures) the product mixture reflected the difference in heat of formation (i.e. energy) between the two products [thermodynamic control]. The Diels-Alder presents us with another example of this very same phenomenon. Let’s draw in the reaction coordinate for the exo product (blue) to make it more clear. At low temperatures, the forward reaction to make the endo is accessible (A→C→D) but not the reverse reaction (D→C→A). Therefore the reaction mixture will reflect the difference in energy between B and C. This is kinetic control. At higher temperatures, the reverse reaction (D→C→A) is energetically accessible, and the reaction becomes an equilibrium between starting materials (A) and the products (D and E). The reaction mixture will reflect the difference in energy of D and E. This is thermodynamic control. 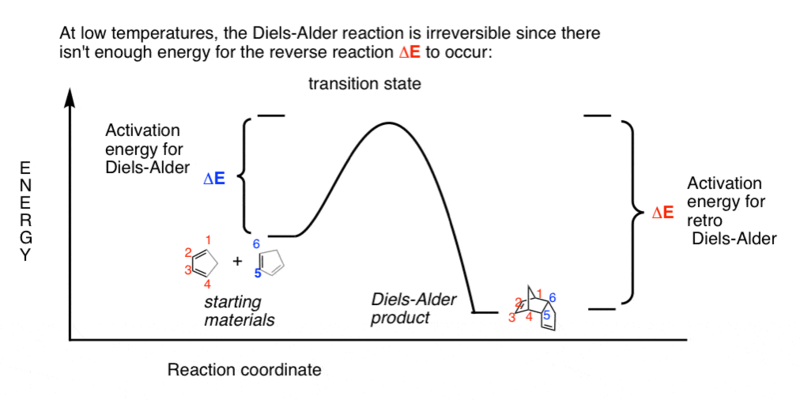 The Diels-Alder is normally run under conditions where the reaction is irreversible, and for reasons we discussed previously [in Why Are Endo Products Favored In The Diels-Alder?] the endo transition state tends to be lower in energy than the exo transition state. Hence, endo products tend to dominate at low temperatures. But at higher temperatures, where the reaction is reversible, more of the exo product will form due to its greater thermodynamic stability. For example, while the Diels-Alder of cyclopentadiene with itself at 23°C gives only the endo product, heating a solution of cyclopentadiene at 200 °C over about 2 days gives an endo:exo ratio of 4:1. [source] . One can even heat a pure endo product and obtain a mixture of exo and endo products! Here’s one prominent example of an exo-selective Diels-Alder reaction. Furan (below) appears similar to cyclopentadiene. But as you may already have seen (or will soon see, here: Rules For Aromaticity] furan has a peculiar property called aromaticity: for this reason, it is about 20 kcal/mol more stable than one would expect based on bond energies alone. Furan can act as a diene in Diels-Alder reactions, but this disrupts the aromaticity of furan. 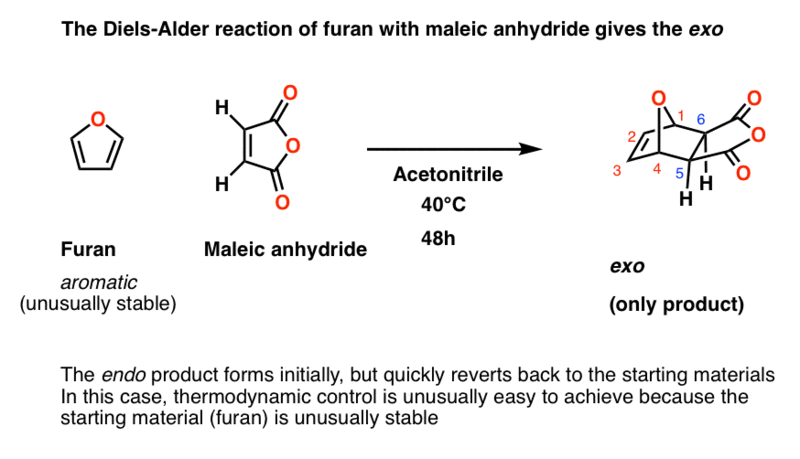 For this reason, Diels-Alder products of furan undergo retro Diels-Alder reactions at much lower temperatures than those of most other dienes. For example, the Diels-Alder reaction of furan with maleic anhydride in acetonitrile at 40 °C gives the exo product exclusively after 48 h.
This is probably enough for one post, but in the next one we’ll briefly go through a few prominent examples of retro Diels-Alder reactions and see how they can be applied in synthesis. Although, it should be noted, cyclopentadiene can be kept in the freezer indefinitely. 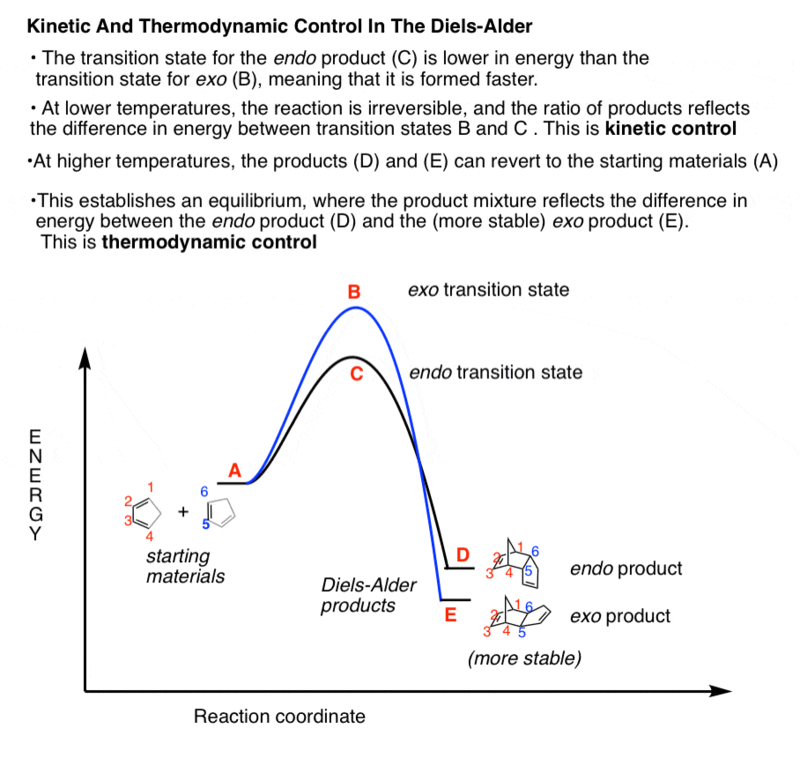 Why might higher temperatures favor the reverse Diels-Alder? where ΔS is the entropy. Even a reaction that is endothermic (positive ΔH) can be made to be spontaneous through heating if the reaction itself has a large entropy (ΔS). In the retro Diels-Alder, a single molecule (the Diels-Alder product) reverts to two starting molecules (the diene and dienophile), which represents a large net increase in entropy. Therefore, heating the reaction (increasing T) will make the –TΔS term increasingly negative, until it dominates the positive ΔH term. The difference in rate of 500 gives a difference in activation energy of 3.8 kcal/mol favoring the endo. Great post! I think you drew the endo product for the furan maleic anhydride reaction by accident. I think your furan-maleic anhydride product is still endo, as pointed out by Bart. You’re right, Slim – things work slowly around here. On the fix list! EDIT: fixed. Thank you!